Does this pump work with all syrup bottles? No, this pump does not work with Monin 750 mL glass syrup bottles. 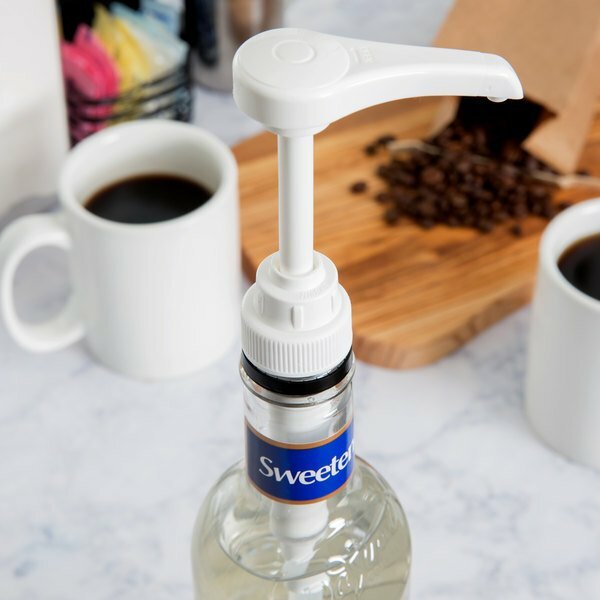 It can be used with a variety of other syrup bottles, including plastic Monin bottles like the Monin 1 Liter Premium Iced Coffee Concentrate. This Tablecraft 66128 flavoring syrup pump makes it easy to dispense flavoring syrup for your flavored coffees, frappes, and mixed drinks! This plastic syrup pump dispenses .25 oz. of syrup with each pump. 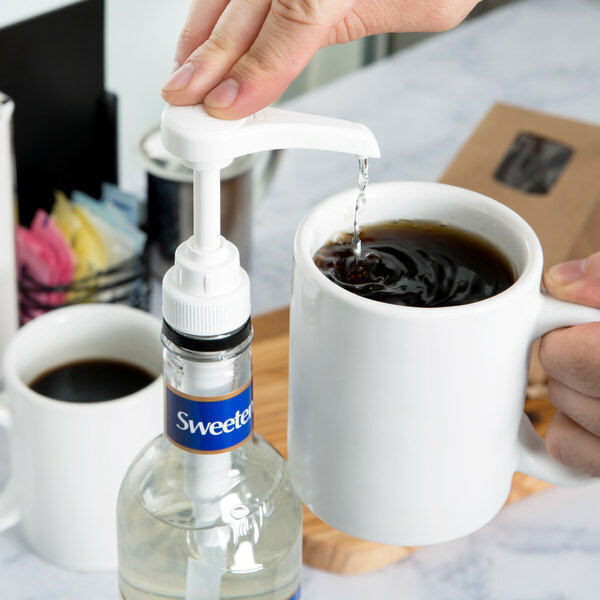 It will dispense a consistent amount of flavoring syrup in each beverage cup, making it easier to control portioning and ultimately save costs. 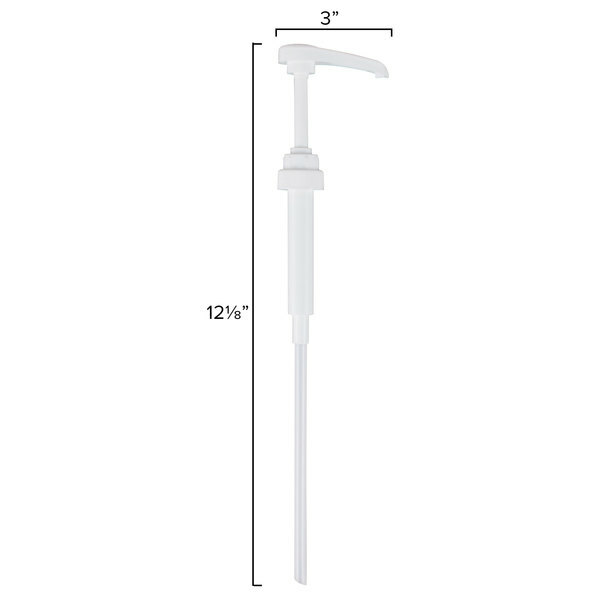 The simple yet dependable design of this no-drip pump is perfect for your coffee shop, bar, hotel, or restaurant's beverage service. This pump is compatible with DaVinci Gourmet 700 mL and 750 mL flavoring syrup bottles, as well as Torani 750 mL flavoring syrup bottles. 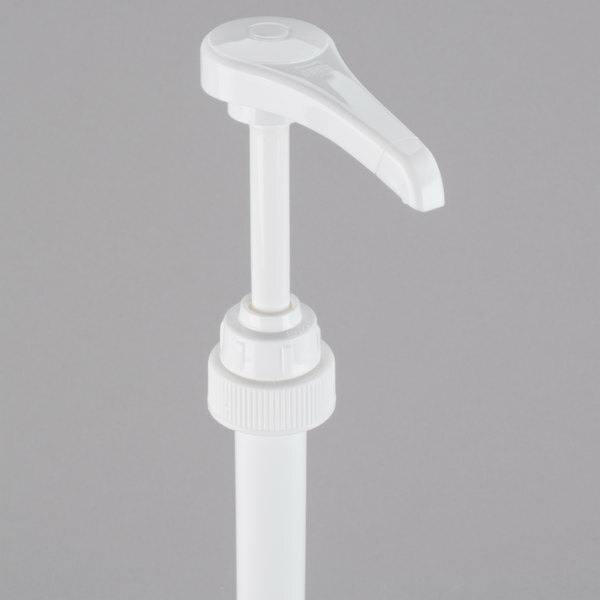 It fits securely around your bottles to eliminate leaks and other messes, and is made with durable plastic material that is quick and easy to clean. Make sure that your business is stocked with all of the essentials, including this Tablecraft .25 oz. syrup pump! This pump is perfect. It gives us the perfect quantity for each glass. We use this one a bunch of different products. I would buy this product again. Great quality. Easy to use and store. Appropriate for all serving and catering needs. Highly recommended. We use it for our beverage flavoring needs in the store. Good pump, accurate volume as long as pump is fully pressed. However if you have a syrup sit unused for a day or two it may have sugar crystallize and jam the interior pump. If this happens, just run them under hot water and do a test pump to remove any solid before reinserting. These rare a perfect fit. Please use the recommended pump for your syrup bottles bec it can be a disaster if not. I put the syrup in the cart and the website was help and suggested this pump. These are essential. 1/4 ounce per pump is perfect too. You can really find that sweet spot for your coffee that your customers will love. We usually have three different DaVinci flavorings out at our coffee station at a time. We love the convenience of these pumps! It makes it very easy to put your cup right up to it and squirt. Finally found a place to buy a syrup pump at a reasonable price. They are heavy duty too and work really well for use intended. Most pumps are pretty much the same but I can definitely say these have gone through a ton of use for the last year and they are still working. Cleaning them is very easy. This syrup pump arrived as described on the website. It does the job it's supposed to do, and it is easy to use and clean. We have a lot of flavors in our coffee shops and wont be possible if we did't have a right pump which gives correct measure. I'll buy again. I wasn’t sure I needed a pump to use with the Torani syrup I love, but I have found that I cannot do without it. I actually purchased several for my Torani syrups. You can be sure that you have used the exact amount of syrup with each latte or flavored tea that you enjoy! I needed the pump for our shake flavors we use. It dispenses accurately and keeps the bottles clean. Easy to wash and pumps quickly. Great price. 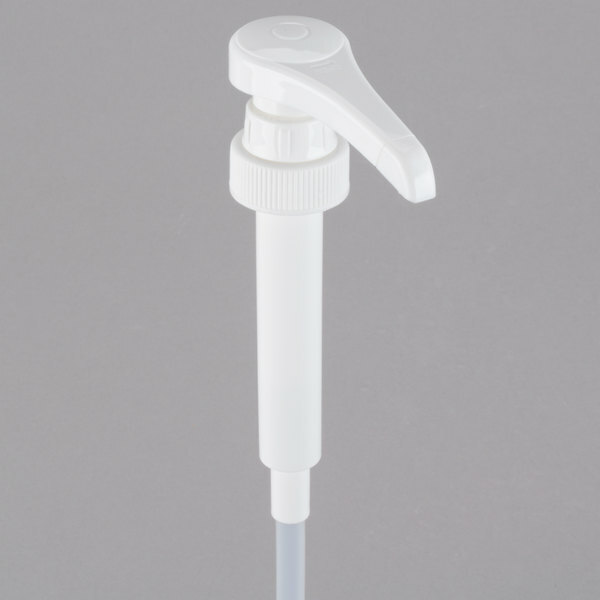 These syrup pumps by Tablecraft are the right size and fits wonderfully on the Torani flavoring bottles. One full pump measures out to be almost .25oz which is a perfect size. A couple pumps in your morning coffee is all you need. Very easy to use, doesn't get sticky or clog. This pump fits perfectly on the torani 750 ml bottles. I have never had any problems with this pump. 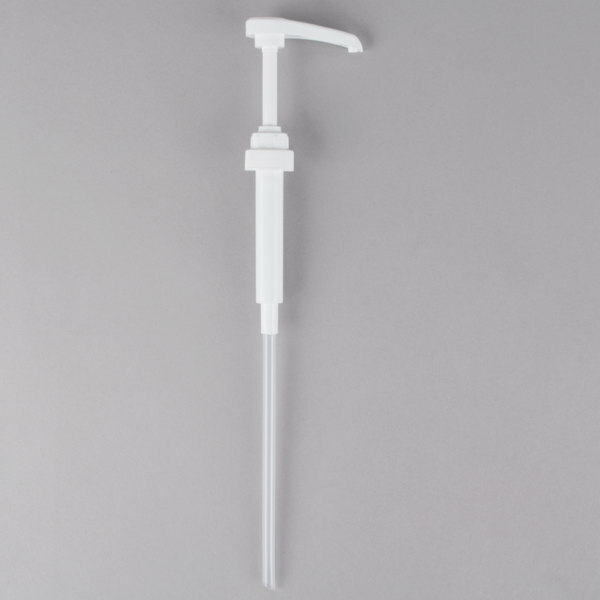 If you are going to serve flavored coffee using Torani flavoring, then you will need this handy little hand pump. It delivers perfect portions every time. Perfect for our torani syrups! Will continue to purchase these pumps when we need replacemets for our syrup bottles. Would recommend these for anyone looking! I have over thirty coffee and Italian soda flavors yet not one pump has broken. They are easy to use and good portion control. Hot water and bleach is the only cleaning you will need. The pumps work great in the flavor syrup bottles. I have not ever had one break. The do need to be cleaned out regularly. The sugar will harden.